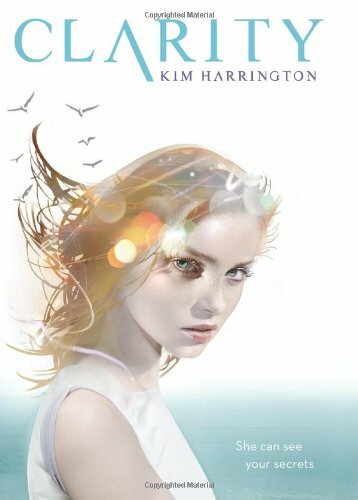 Scholastic are offering Two (2) copies of Clarity by Kim Harrington! To enter, just leave a comment letting me know how would you feel if you could see things no one else could? For me it would be kid of weird at first because everybody would be starring at you and wouldn't be your friend.. but like after awhile i would get used to it. I think it would be cool, but there's no way I could keep it a secret and probably would end up in the looney bin. I think it would be really rough because everyone would think I was crazy, especially as a young kid when you tend to blurt out everything you see, not understanding that some things should be kept private. I would like it -- but I don't think I would want my kids to have that ability. I some respects I think it'd be great but in everyday life I think it would frighten me. Sometimes it's better not to know, if you know what I mean. I don't think I'd want to see things others couldn't. I'm to anxious already. So ya it would be creepy, but I'd love to read about :). I think it would come in handy at times, but overall I think it would become a burden. I think I would feel special, but a little freaked out if I could see things other's couldn't. I'd try to use that "gift" to do something positive, like help others with closure or to bring a killer to justice. I'm not sure I would like it. I think I would always be wondering if what I was seeing was real. I think I would like it at first, but then after a while, I would be scared, esp if I know about crimes and stuff like that. I prefer to keep my mind sheltered most of the time, so having that ability would probably freak me out. I think it would be cool but I don't think I would tell anyone other than maybe my best friend who I completely trust, I would hope she wouldn't think I was crazy thought. If I could see things no one else could, I'd feel like I was going crazy. And that I couldn't talk to anyone about it or *they* would think I was crazy. I live in my house with my hubby and 2 sons. I do see things no one else does...the laundry, the dirty dishes, the empty dog bowl,...etc, lol. I'd love to be able to see things that no one else does. It'd be a hard secret to keep, but it would certainly make life interesting. I'd think I had gone round the bin. I think it would seem cool but really it would be scary. To know that you can touch things and you can see things. That would be scary because what if it is something you don't want to see. No thank you. That is one super power that is not on my wish list. I would worry about my sanity. I think it would really depend on what I was seeing. And whether or not I had to tell someone what I saw. I'm sure at times it would be awesome. But other times could be really difficult. As cruel as some people can still be I'd try to conceal it aas much as possible unless it was serious and needed to be shared. If I could see things no one else could, I would start freaking out. In books, when the protagonist sees things no one else can, bad things happen to them or at least the bad guys find them. I'd rather not see them. Being able to see things no one else could would be good and bad. I would love to be able to see the good things, but I would hate to see the bad. How frightening that would be! I don't think I would like it. It would put alot of stress on you, even if you did handle it well. You would always know things other people don't. I would imagine it would be lonely. Since you are the only one who could see it, no one else would understand about it. But every once in awhile, I think it would come in handy. I think initially I'd be thrilled. If I couldn't control it or turn it off, it would then probably become a problem. At first I think I'd think I'm crazy. Then over time I'd probably think it's just really cool! I would not want to see things other people can't...I am crazy enough without giving people extra reasons to think so. I am not sure how I would feel if I could see things no one else could. I would think that it would take some getting used to to learn what others could see and what they couldn't so I wouldn't make a fool of myself. It would be a difficult thing to live with I'm sure. I'm not really sure how I would feel. I think it would just be one heck of a roller coster of emotions lol. It would be most unnerving. I'm sure that my mental state would be very suspect. If I could see things that no one else could I would seriously be freaked out. I don't think I could handle having that kind of power. I think it would probably be really creepy! I think it would be really intense and difficult, because you would be experiencing all of these things but not be able to show that you were seeing them because people would not understand if you were seeing things that they themselves couldn't see. On the other hand, it would certainly be helpful in terms of investigating and learning more about people, though that could also be considered a curse since you would know things that people had yet to tell you, and they might be things you never wanted to know about this person. Thank you for the thought provoking question and the giveaway! I think I would have a hard time seeing and knowing things no one else could. For one thing, not everything you found out would be nice. And it would be hard on me to know things, especially bad things..like knowledge about a murderer and not be able to tell someone because I would have no proof. Definitely not an ability I would prefer to have. It would make me feel special but isolated. I think it would become a burden after a while. Sounds like one of those things that usually has you lumped into the "weird" girls that small-minded people tend to avoid. Not fun. I think it would be very creepy I would not like it at all! Thank you so much for the great giveaway! I think it would make me feel crazy. leave a comment letting me know how would you feel if you could see things no one else could? It would be a very hard thing to deal with....A need to make people believe you! so hard but could be very helpful too. Probably both terrified and intreagued at the same time, you know? Cause it would be cool but scary, cause I would be more of a freak than I am now. Gah! I think that it would be incredibly unsettling and would take a good long while to adjust to such. If I could see things that no one else could, I think I would be happy at first maybe a little scared, and then, just maybe, sad. Knowing things is not always a gooding thing expectly if it belongs to the people you love. Thanks for the giveaway, I would really love to win this book. I think it would be fun to see things no one else can. It's like you have this cool power over everyone else. I would like it if people believed me, but I wouldn't want to be sent to the loony bin! It would be kinda freaky to see things no one else could see. But I think it would be pretty cool too.